In field work, in order to get to know people in the way people feel comfortable or familiar with, ethnographers always take many different roles. Three years ago, in my PhD field work I used to help in a mobile phone shop in order to get first-hand information of the local mobile phone market. 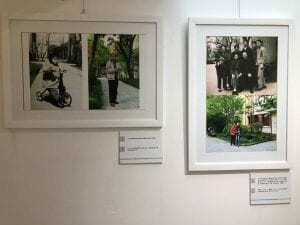 This time, in order to know the personal history of the older generation who live in an old-style residential compound in the city center of Shanghai, I took the role of exhibition curator of the community exhibition. It was in an interview with the officials of the living compound early this year, I first heard the news that the local ‘street office’ (jie dao) is thinking of holding an exhibition about the residents in the compound. One month later I started to interview households, compile the oral history of residents as volunteer curator. 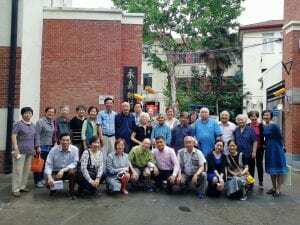 The curation of the exhibition is a perfect opportunity to justify myself to enter into many households in this residential compound – the majority of them are in their 60s, 70s, and 80s, some of them have been living here for more than 70 years. In-depth interviews usually took 3-4 hours, with the longest one being 7 hours – the old gentleman in his 80s was so generous to tell me his whole life with abundant old photos in that interview. After the interview, I became friends with my interviewees and all of them were willing to talk to me again and urged me to visit them more. The older generation who went through the fall of the Qing dynasty (the oldest cohort in their 90s), the chaos of the warlord era, the Sino-Japan war, civil war, the Cultural revolution, the economic reform has kept their mouths shut for ages. Now, finally, they feel the need to tell their stories, which, in many respects, has been full of suffering and trauma, as otherwise they would take these experiences with them to the grave. And they know I am an unbiased listener. 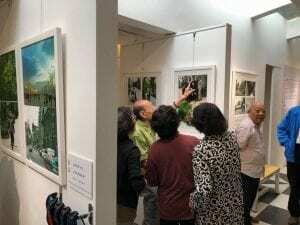 The exhibition was launched on 19th May 2018. It was very well received: in the past one month, the exhibition was reported by the local TV and newspapers. People shared articles about the exhibition among neighbors, friends and families via social media. Many representatives from various parts of the Shanghai government and the party visited, including the deputy Communist Party Secretary of Shanghai, Mr. Yin and his colleagues. 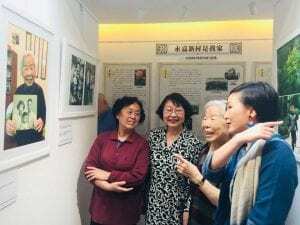 The most delightful aspect was that some residents have come to the exhibition hall to meet old friends – finally they feel this exhibition hall has become a space they can connect to. As the preface of the exhibition says: The exhibition hall is not only the place to display, but also the space where the oral history project of this living compound is carried out. Residents are welcomed to use the exhibition hall as a communal living room where old neighbors and new friends can sit down and chat. The exhibition will last for a few months. There will be regular updates with more stories. Now I am working on the updates of the exhibition as more residents have come forward to share their family stories.